We've had a visitor recently. 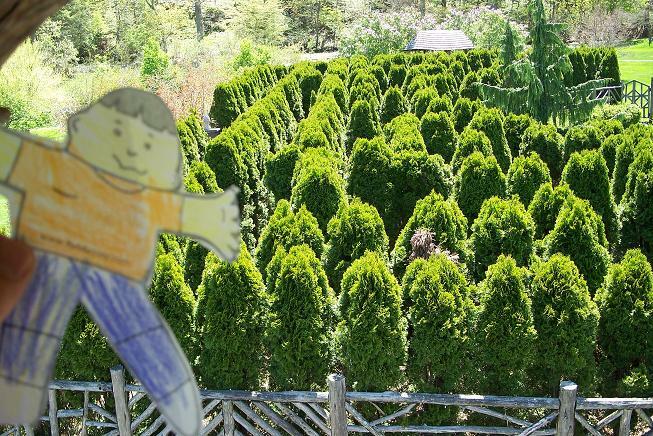 His name is Flat Stanley. Our nephew asked us if he could come visit, as he's never been to this part of New York State. Of course, we agreed and set off to show him the sights. 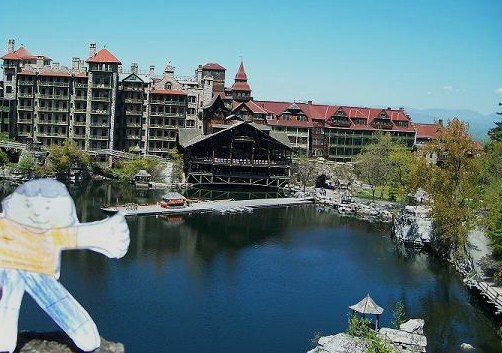 His first adventure was a visit to Mohonk Mountain House, in New Paltz, New York. He got a ride there with our nephew's cousin, who works there. You can check out Mohonk at their website, www.mohonk.com, but there's nothing like seeing the place up close and personal. Flat set right off to take in the views! And, not one to stay put, Flat was all over the place in a flash. He climbed to the top of a summerhouse, to look at the gardens from a high point. Two stories up he could take in all of the plants that are preparing to flower for the season. Flat was pretty brave going up there by himself...he could easily have been blown away, as it gets pretty windy up there on the mountain sometimes! Flat spent most of the day hanging around the mountain house, and while there's lots of places to hike and walk, they have bicycles, horses, golf, tennis, swimming and more...but the best thing to do, and Flat was sure not to leave before he got to it, was taking a boat out on the lake. 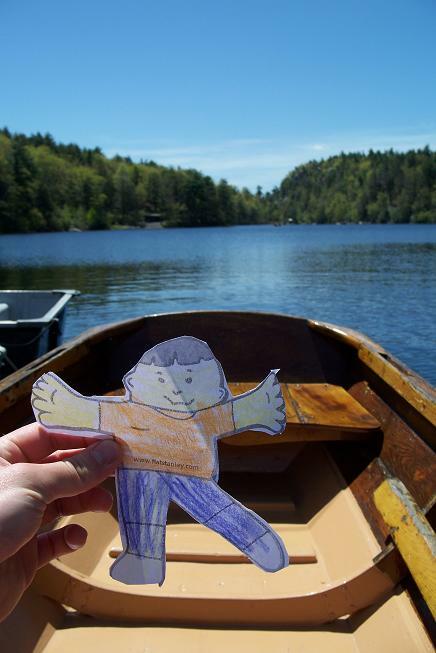 Here's a picture of Flat rowing his way across Lake Mohonk. He was even doing it without paddles, which is pretty good. Most people have to row and row, but not Flat. He was able to sail from one end to the other, without any oars at all! 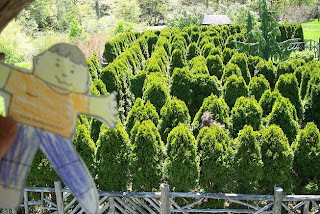 Before he left Mohonk, Flat was sure to check out the maze. Here, you can go round and round and round, and almost get lost, but good thing for Flat, you end up at the beginning when you're done...whew! Flat would have liked to have stayed at Mohonk, but he had to get back to our house so that he could go for a ride. We were going flower shopping, to start getting plants for our gardens, and we were hoping that Flat could help us pick out some flats! Figured with his name, he'd be an expert. So, we jumped into the car. Flat was in such a hurry, that when we went out to get into the car, he was all ready there...he couldn't wait to go to the greenhouses! Flat didn't ride on the outside of the car, don't worry. We buckled him in, seat belts of course, and set off. The only thing was that it was raining a bit, but Flat didn't mind...he fits nicely between the raindrops. The greenhouse we go to is only about 15 minutes from our house and they have lots of plants, flowers and vegetables, to pick from. When we got there, Flat took off. It took us a few minutes to find him, but there he was...we should have known...he laid down on the first flat he came across. We went through all of the buildings there to see what was for sale this year. There were marigolds, petunias, tomato plants, geraniums, chives, lettuce and more. They had lots and lots of flats of plants, but we had the real Flat with us, and just when we thought we'd have to go looking for him...there he was. Flat was all ready checking out what was going on in the greenhouses and was taking in the view from some hanging plants. Flat was having a great time. Even though it was raining outside, it was nice and warm and dry inside and we were able to shop for a while. We ended up getting a whole flat of marigolds and then mixed up another flat with tomatoes, coleus and some small colorful plants whose name we can't remember. We did end up buying some seed packets, pumpkins and cucumbers, and Flat will have to come back to see them when they start to grow. We went outside to pay and when we were getting ready to go, we noticed that Flat wasn't with us. Didn't take us long to see that Flat was tired. There he was, taking a nap in the coleus. 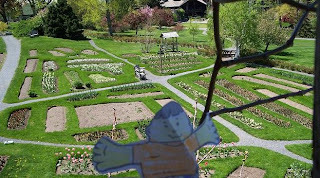 Flat's visit to the Mountain House, the ride in the car, and the adventures in the greenhouses had tired him out! We went back home for lunch. While we had a sandwich, Flat said he wasn't real hungry, but did have some Wheat Thins and a couple of Thin Mints....hmmmm....maybe that's why Flat stays so thin? Not only is Flat inclined to visit, he does list to one side, he travels light...he weighs less than an ounce and keeps his trim figure by never eating or drinking. The perfect guest, he stays in one place, doesn't talk back and is content to be by himself for days on end...now that I'm thinking of it, for anyone who might want to take him out on the town, he's the ultimate cheap date! I'll see if I can make travel plans (as in find an envelope with a stamp) and check schedules to see when he can head out (as in when I can get to the Post Office). I'm sure he'll love seeing California!!! Thanks!! !